On the outskirts of Paris, a prostitute is found murdered in a vacant lot. In a seedy apartment house nearby lives pasty, fat Mr. Hire. Mr. Hire, who earns his living through a petty postal scam, is a convicted pornographer, a peeping Tom, and, once a week, the unlikely star of a Parisian bowling club, where people think he works for the police. He is a faceless man of regular habits who keeps to himself and gives his neighbors the creeps. After the murder, Mr. Hire’s concierge points a finger at him: he was out late the night of the crime. The police have the suspect under 24-hour surveillance. They are only waiting for him to make the inevitable mistake and give himself away. Except that creepy Mr. Hire is in fact an innocent man, whose only mistake is to have fallen head-over-heels in love with the wrong girl. 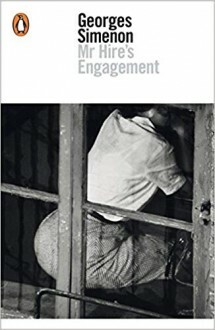 One of the most chilling and compassionate of Simenon’s extraordinary psychological novels, The Engagement explores the mystery of a blameless heart in a compromised soul. blah -- the guy (Mr. Hire)'s a neurotic slug.